Yesterday, I joined Common, J Cole, Andra Day, and others in raising our voices to bring about change to a clearly broken criminal justice system that long ago failed to accomplish its intended goal of rehabilitation. A few months ago, again joining Common, I was blessed to meet some men incarcerated at Lancaster State Prison. That experience and the one tonight have solidified for me the sense of great responsibility that we all have to do more. With the fierce urgency of now, we all have a role to drive the conversation beyond incarceration toward prevention and rehabilitation. While at Lancaster a few of the men were curious as to why union leaders were present. I shared with them the perspective of our SEIU 2015 members — we believe that for our movement to be relevant for 21st century workers, we must be a movement that sits in unfamiliar spaces and helps develop solutions to the challenges impacting all our communities. Yesteryear’s labor movement focused narrowly on its members alone, just won’t do anymore. Local 2015 members believe that when formerly incarcerated men and women seek to re-integrate back into their community that the 21st century labor movement must there to support them in finding meaningful employment and help them find belonging and purpose. We must shape a restorative justice system that does not seek to criminalize whole communities, but instead creates opportunities for prevention and integration. Most importantly, this system must be grounded in the fundamental premise that all people are innocent until proven guilty and that all of us deserve a fair second chance. 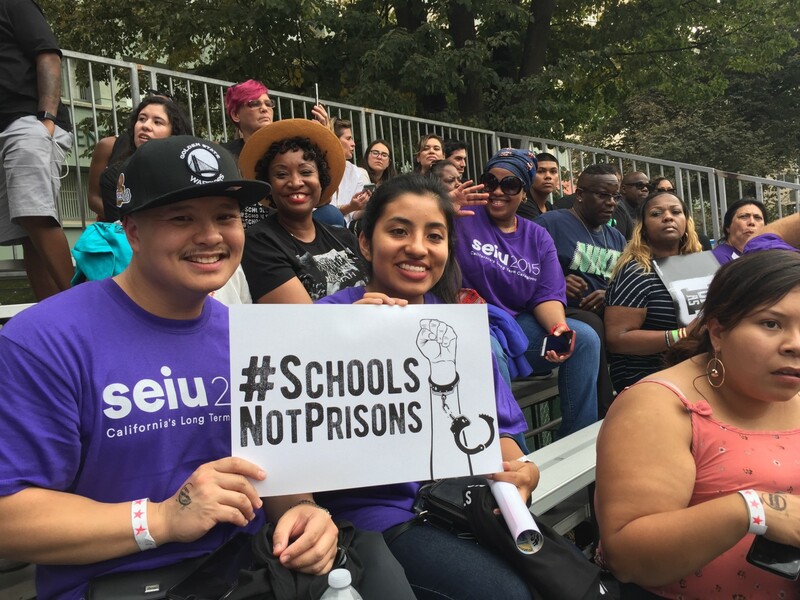 SEIU 2015 is committed to a social justice agenda that is not just about resisting in this moment, but aimed at charting a real course toward a just and equitable future. Our members believe in using their collective voices in challenging and eliminating injustices which impact their families, neighbors and communities. I was so proud yesterday to stand with Common and other allies in this cause to call on California legislators and Governor Brown to pass Senate Bill 10, and other policies that eliminate life without parole sentences for juveniles, includes bail reform and reductions in harsh sentences for juveniles, and gives kids the chance to expunge their criminal records. Join us in taking a step in this right direction toward restorative justice.